At the distance of 40 or 50 years it is tempting to think of George Goldner as something of a "character", a "lovable rogue" perhaps. He was certainly one of those colourful pioneers in the formation of R & B in the musical Wild West of the 50s. But I think the temptation should be resisted. Whether you were one of those hundreds - maybe thousands - of young hopefuls looking for stardom whom he exploited so ruthlessly or you were one of many people in the music business who fell foul of his mobbed up companions gathered via his habitual gambling debts, he probably wouldn't have seemed quite so agreeable. If you had occasion to shake his hand you would certainly count your fingers afterwards. Yes sir. His legacy, based on the talents of his artists rather than on any great musical ability on his part, is of course all the discs he put out on his range of labels especially Tico, Gone and End. And although we think of the last two as mainly doo wop oriented concerns, End lasted until early 1965 and towards its last years released a few early soul numbers. Amongst the best were the wonderful Lenny Curtis' "Who You Gonna Run To" and an absolute peach from Harry Starr entitled "Step Into Your World". Both these tracks have big ticket Northern soul interest on the other sides but I want to rescue the super uptown flips. 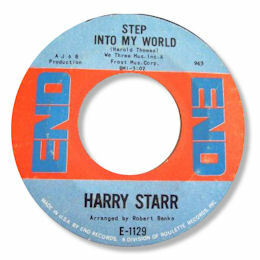 Step Into My World has a lovely catchy melody and strong lyric courtesy of writer Harold Thomas (Prince Harold) plus a careful and sensitive production from Robert Banks. But the real power of the cut lies in Harry's gritty determined vocal. Just listen to the rough tough tone and gospel tricks he shows, plus the really impressive sense of dynamics. This is top quality stuff all right. 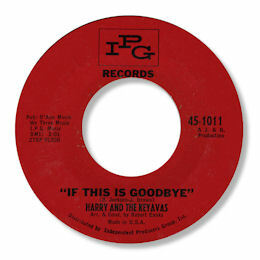 UPDATE ~ Katsuaki Sano, whose knowledge of soul music - deep in particular - is immense has written to me to remind me that Harry Starr had another 45 out as Harry & The Keyavas. I have the single in my collection but it had completely slipped my mind - old age etc. Both sides are very good early soul ballads but If This Is Goodbye takes most of the honours for it's stronger melody and grittier vocal performance. A really nice 45 indeed. Sano-san has written a very fine book mainly about the sort of music found on this website entitles "Raku Soul". Note ~ "Step into my world" can be found on the Westside UK CD "George Goldner Presents The End Story". Also on the CD is a very lively unissued cut "Live It Up". Pete Nickols kindly writes to say that both sides of Harry's 45 also appeared on the Sequel CD "Soul Underground Volume 1 - Feelin' Good All Over". Thanks Pete.